Critical Language Scholarship (CLS) Program students in Beijing not only improve their Chinese language skills, they also gain a deeper understanding of Chinese culture through participation in structured cultural activities and by living with host families throughout the eight-week program. 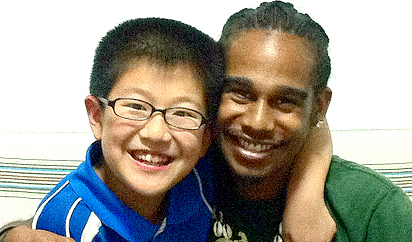 CLS Beijing students often develop close bonds with their host families and learn nuances of Chinese culture. In turn, their Chinese host families learn more about the United States, particularly its diversity. The host family experience allows for the deepening of mutual understanding between the United States and China. For Myles Postell-Reynolds and his host family, this was certainly the case. Postell-Reynolds’ host family was impressed with his enthusiasm for learning and ability to integrate into the family in a short time. They also enjoyed the opportunity to see some of their Chinese customs through new eyes. After completing the CLS Program in Beijing, Postell-Reynolds returned to Morehouse College in Georgia, where he is studying international relations. He plans to continue to study Chinese and hopes to use it in his future career.